This German horror film from 2000 stars Franka Potente, the breakout star of the 1998 film "Run Lola Run". It answers the question how do they really get the bodies for those amazing Body Worlds Exhibits? Real human bodies injected with a plastic-like substance leaving their muscles and vital organs on display in amazing detail. Medical horror movies seem to hit a nerve, so to speak, as they prey on primal fears that everyone can relate to. All the way back to the original Frankenstein, medical horrors have been a staple of the genre. The environments are cold and sterile with lots of stainless steel instruments from scalpels, saws, and drills. Putting your life in the hands of a possibly insane stranger, is there anything else scarier? Yes, there is being operated on while still awake! Ahhhhh! Paula is a bright med student who gets accepted to the prestigious Heidelberg Medical School who discovers the existence of a secret society. Heidelberg opens its new state of the art anatomy wing where the students have access to all the corpses they can handle. But when Paula recognizes a guy who ends up on her table she starts to investigate his death. She finds a mysterious tattoo on his ankle and a very unusual blood sample. It is found to have a sort of plastic polymer in it. Paula's investigations lead to an ancient secret society called the Anti-hippocratics. All doctors take a Hippocratic oath to help patients, but not this group. Their research is paramount as they use live people to practice on and learn from. Putting aside medical ethics for "the greater good". Although this movie is pretty dark and disturbing, there are several moments of dark humor that lighten the mood a bit. The effects used are pretty awesome and the highlight of the movie. It does, however, suffer from a poor script and doesn't hold up to a reality check. 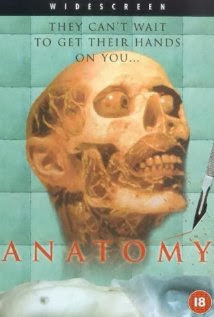 "Anatomy" is an intense and graphic ride that is worth at least one watch. The Body Worlds exhibits that continue to travel around the world did originate in Germany but thankfully use willing donors.